A blog where I try to blend my love of Engineering Mechanics and Historical European Swordsmanship (HES), hopefully providing some useful information to the HES community and showing fun applications of science. This article is the first in a very long time (apparently like 2 years), owing mainly to life happening. Not too long ago, a friend approached me with a question: “How much of a force multiplier is a sword?”, in the context of getting hit by blunt swords during training. It’d been a while since I did much mechanics, so I set down to answering that question. 11 Nov 2017: Finally fixed the inaccurate statement regarding inelastic collisions, and re-explained a bit. Hopefully this is a bit more accurate. To Straighten Or Not to Straighten: That is the question! I was at an event this summer that included an armored deed of arms (read: dudes in full armor fighting as dudes in full armor). 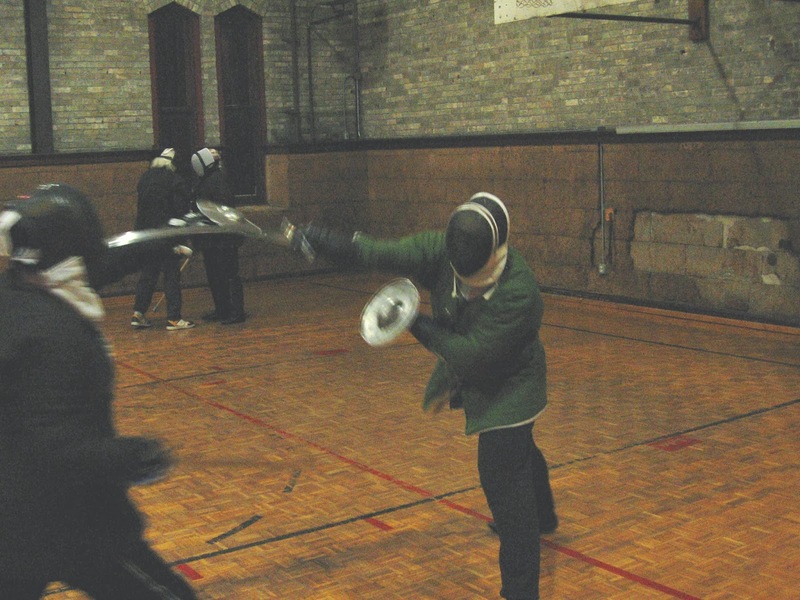 As sometimes happens during such events (and really any fencing), a sword bent enough to permanently deform it. A marshal was about to straighten it when a participant called from the sidelines to replace the weapon because after bending it back, it may be more likely to break the next time. Replacing the bent weapon was a safe call for many reasons, and in my opinion the right call at the time. But how about that breaking part? Let's talk a bit about that and a mode of failure called fatigue. For the impatient: yes, bending the weapon back does indeed increase the likelihood of failure, especially if it is loaded the same way repeatedly (it likely will be) or has been bent back multiple times. How much it increases the likelihood depends on many factors, but it is a safe play to remove the weapon from use until it can be repaired properly (if it can be at all, which also depends on many factors). Flexible trainers of all types will tend to have a lifetime due to the cyclic loading and and a failure process called fatigue, but that lifetime will generally be fairly long (like years) if they are properly made, used and maintained. However, notches and other surface damage, and plastic deformation of the blade can dramatically lower this lifetime. And the main danger of fatigue failure is that it can occur with little to no warning during the use of the item, unlike most acute failure modes like fracture. For the patient: read on. In a series of earlier posts, I talked a bit about equipment safety standards and how the homologation rules used by the FIE could be useful in constructing a set of HES-specific equipment safety guidelines. However, much of that was very high level as I had no data to back up some of my claims and could not work through some comparisons with the FIE standards. In my posts on effective bending stiffness and blade buckling, I used FIE weapons rules to provide some comparisons with HES trainers but did not discuss their relevance to safety equipment in much detail. So now that we have some data on thrusts, and that is the major focus of FIE homologation, let's use the data to see what we can learn! In this part, I'll focus on neck injuries and some mask constraints based on the thrust data. Now that the International Congress on Medieval Studies in Kalamazoo, MI has come and gone, I can talk about some tests I did for a good friend's paper at the conference: penetration testing on a reconstruction of the Lubbek Wappenrock. This marks the first real outing of Da Towa, and so this post will also discuss some of the changes I have made and will make in the future. Since I'm chugging away on a rather detailed follow-on post to the thrust & buckling post, I figured it was time for a fun one… and this time it's one that I'd been thinking about for a while. Ever heard that metallic ping when heating a metal pan on a stove, or letting one cool? I'm willing to bet most people have. Effective Bending Stiffness & Buckling Load Update! Last year, I wrote a post about the effective bending stiffness of flexible trainers and had measurements of trainers I was able to get my hands on at the time. Well, thanks to my good friends at the Chicago Swordplay Guild, CSG North, the CSG 'Southern Expeditionary Force', the Rocky Mountain Swordplay Guild, and the Susquehanna Valley Swordplay Guild, I was able to get a pile more during a recent trip to Chicago. I only added arming sword and longsword measurements. Sorry rapieristi and other later-period types: I'll give you all some love once I put together a portable method to deal with all them crazy hilt fittings. I decided to calculate the absolute error in the effective bending stiffness, \(EI\), based on the estimated accuracy of my measurement methods. These will be included on the graphs given here. For the FIE ranges, since these were back-calculated, I've assumed the error to be zero (no measurements, no error). I also updated the buckling load list, and will include those as well to help put things in perspective. I decided to interpret the data based my own personal experience with the weapons based on the Subjective Index of Sparky Skewering Efficacy, or SISS-E, since I found some of the trends interesting. Bathroom Scale Apparatus Gets An Upgrade! In a previous post I talked about some unholy things (and by unholy, I mean awesome) I did to a digital bathroom scale so I could make a force measurement setup. Well, I finally arrived at a setup that I was able to use, so I wanted to take some time to document the equipment. The equipment discussed here is the same equipment used to collect the force data in the thrusts and column buckling post. Here's the DAQ system and a single load cell being tested. Update 4 March 2014: fixed a typo in the force resolution. It should have been 6 N, not 0.6 N.
In an earlier post, I talked about determining the effective bending stiffness for sword trainers. Towards the end of that post I mentioned that this quantity, the product of the elastic modulus and the relevant area moment of inertia (\(EI\)), is useful when looking at what occurs when a blade just begins to flex. This sort of analysis can be used to look at how the effective bending stiffness of a trainer can be translated into an equipment safety design rule. And after the last spattering of materials science related posts, I promised some more classical mechanics. So here we go! Let's start with a simple and common scenario: a fencer thrusts at a target with a flexible trainer. I'm willing to bet that a lot of the readers of this blog have been on both ends of this scenario. I won't say which one I am. From experience, you'll know that the blade begins to flex after contact. Let's look in detail at what happens in that moment. Update, 4 March 2014: fixed a typo in the force resolution. It should have been 6 N, not 0.6 N.
Update, 14 Feb 2014: I revisited the initial image analysis and found the approximate speed at time of impact to be about 2 m/s (~6.6 ft/s or ~4.5 mph), though this suffers from the same limitations as the other conclusions from the same analysis. Update, 9 Feb 2014: I went back and repeated the thrust force measurement with my Lichtenauer (same weapon as the test shown), and my Tinker-Hanwei Arming Sword and Longsword. The results for the Lichtenauer were consistent with those shown here. Woot for repeatability. The data from the Tinker-Hanwei swords exhibited similar characteristics as well, but at lower load ranges as expected based on the buckling load work I discuss here. Yay for predictive science! I am still working through the data, but felt this was worth an update. "He [Fiore Dei Liberi] also longed to learn the temper of iron, of the nature of each weapon and of its aptness for defense and offense." -- Fiore Dei Liberi, Getty MS as translated by Tom Leoni. In an earlier post we discussed some of the basics of phase diagrams, using the iron-carbon (i.e. steel/cast iron) system as an example. While some talk of heating, heat treatment and quenching came up in the discussion, this is such an interesting and important area I wanted to give it its own space. Besides, Fiore apparently thought it was important too. In previous posts, and in many posts that will follow, I'll say things like 'if we assume we did this instantaneously' or 'If we can do this very rapidly' or 'the change happens nearly instantaneously'. On the outside, this seems pretty simple: I'm talking about something happening in a short period of time. But how short is short? Like so many things I've mentioned: it depends on who you ask. I'm a practitioner and instructor of Medieval/early Renaissance swordsmanship. I hold a B.S. and Ph.D. in Mechanical Engineering. I currently work as a research engineer in the auto industry. I've done work on vehicle testing, vehicle systems engineering, hydrogen fuel cells, radiation damage of materials, and multiple length scale simulation methods. All I ask is that you don't claim this stuff as your own. Simple theme. Theme images by luoman. Powered by Blogger.